The Westland Welkin was a British twin-engine heavy fighter from the Westland Aircraft Company, designed to fight at extremely high altitudes, in the stratosphere; the word welkin meaning 'the vault of heaven' or the upper atmosphere. First conceived in 1940, the plane was built in response to the arrival of modified Junkers Ju 86P bombers flying reconnaissance missions that suggested the Luftwaffe might attempt to re-open the bombing of England from high altitude. Construction was from 1942–43. The threat never materialised; consequently, Westland produced only a small number of Welkins and few of these flew. 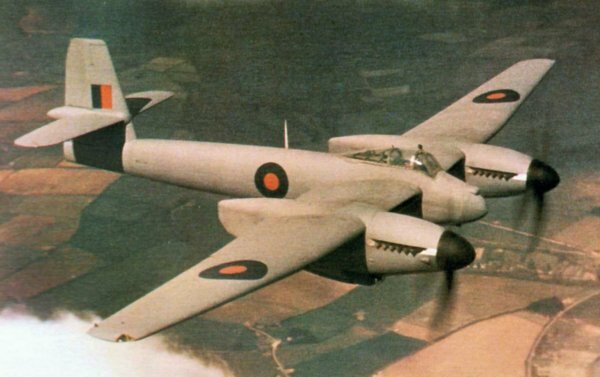 Westland put forward their P.14, essentially an adaptation of Westland's Whirlwind fighter layout (and a more experimental twin, the P.13) to meet Air Ministry Specification F.4 of 1940 for a high altitude fighter. The most obvious feature was the enormous high aspect ratio wing, with a span on the production aircraft of 70 feet (21 m). 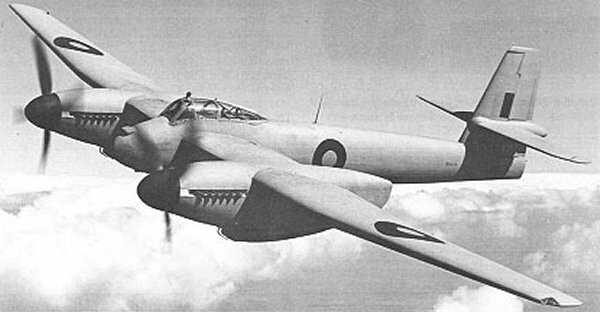 The compact but troublesome Rolls-Royce Peregrine engines of the Whirlwind were replaced by the more powerful two-stage Rolls Royce Merlin Mk.76/77. However, the most significant feature was a pressurised cockpit. The last item required the majority of the effort in designing what would become the Welkin. After extensive development a new cockpit was developed that was built out of heavy-gauge duraluminium bolted directly to the front of the main spar. The cockpit hood used an internal layer of thick perspex to hold the pressure, and an outer thin layer to form a smooth line. Heated air was blown between the two to keep the canopy clear of frost. The pressurisation system was driven by a Rotol supercharger attached to the left-hand engine (this was the difference between the Merlin 76 and 77), providing a constant pressure of 3.5 psi (24 kPa) over the exterior pressure. This resulted in an apparent cabin altitude of 24,000 feet (7,300 m) when the aircraft was operating at its design altitude of 45,000 ft (14,000 m). This cabin altitude was still too high for normal breathing, so the pilot had to wear an oxygen mask during flight. A rubber gasket filled with the pressurized air sealed the canopy when the system was turned on, and a valve ensured the pressure was controlled automatically. Moreover, the pilot also had to wear a high altitude suit as he might have been required to bail out at altitude. The Welkin required a sophisticated electrical system. This was to minimise the number of seals and points of entry in the cockpit for the controls and instrumentation. It took an electrician experienced in the features of the Welkin four hours to undertake a pre-flight check of this system. The wings were so large that the high lift Fowler flaps of the Whirlwind were not needed, and were replaced by a simple split flap. The extra wing area also required more stability, so the tail was lengthened to provide a longer moment arm. The armament − four Hispano 20 mm cannon − was the same as the Whirlwind's, but the Welkin carried the guns in a tray in its belly, which facilitated loading. In that position, muzzle flash was also less likely to dazzle the pilot. By the time the Welkin Mk I was complete and in production, it was apparent that the Luftwaffe was no longer conducting high altitude missions, due largely to successful interceptions by specially modified Supermarine Spitfires. Only 77 complete Welkins were produced, plus a further 26 as engine-less airframes. Two Welkins served with the Fighter Interception Unit based at RAF Wittering from May to November 1944, where they were used to gain experience and formulate tactics for high altitude fighter operations. 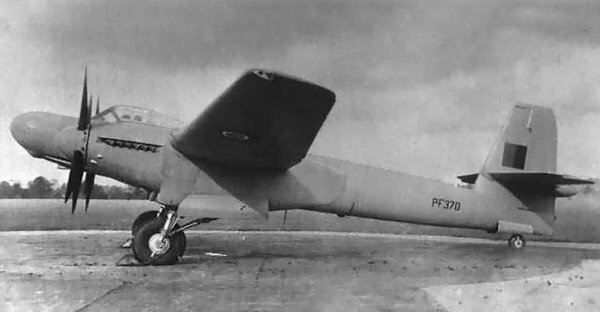 A two-seat, radar-equipped night fighter version known as the Welkin NF.Mk II for specification F.9/43 was developed but only one was eventually produced as the variant was not ordered into production. The Welkin types, both produced at Yeovil. Welkin Mk I - Single-seat twin-engine high altitude fighter aircraft. 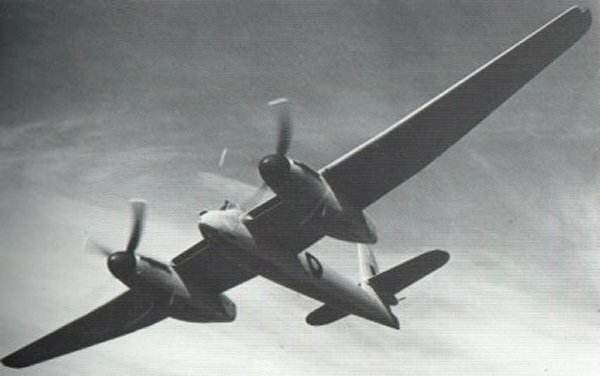 Welkin NF Mk II - Two-seat night fighter prototype. Westland Welkin Mk I in flight. Westland Welkin Mk I, emphasising the great span of the high-aspect ratio wings. Westland Welkin NF Mk II - a two-seat, radar-equipped (in the large nose) night fighter.